I was listening to the This Week in Mormons Podcast when I heard this chapel mentioned. As I looked at the photos, some things stuck out to me. I wish there were some better photos of this chapel. The only ones I could find were small and, unfortunately, dark and look like they were taken with a camera phone. Symbolically speaking, the numbers 3, 4 and 8 are perhaps the most appropriate to be featured on a chapel considering the purposes of which it exists. 3 signifies divine unity while four expresses mortality and perhaps the Aaronic priesthood in that the square is a sign associate with this authority. Eight is a symbol connected with rebirth and especially Christ and we see a lot of the number eight in LDS chapel construction. I love the fact that there are such large and numerous windows on the outside of the chapel. This will let in a great amount of natural lighting and light very symbolic, representing truth, intelligence, the Holy Spirit, glory and more. There are two sets of windows on this side of the chapel and if there are two sets on the other side that would equal four, which as I mentioned before, is associated with mortality and potentially Aaronic priesthood authority. This room is also where the sacrament is administered by Aaronic priesthood authority as well so this is appropriate. The windows are divided into 10 segments each and the number 10 potentially references completion, wholeness, and eternal life. 4 sets of 10 equals the number 40, which Val Brinkerhoff observes is closely tied to the number 8 as it relates to purification (I’ll have to post a reference to this later as a friend is borrowing my book which has the quote I’m needing), so it’s quite exciting to discover this in the architecture. This chapel is where we gather each 7th day to worship on the Sabbath. 4 x 3 = 12 which is a number associated with priesthood power, thus priesthood and perfection are intertwined. Though you can only make out six, I am almost positive that this chapel has 8 lights like most do today. While they are not pillars, anciently the number 8 was used in shape and in number of pillars to denote sacred space, especially in ordinances relating to rebirth. The one thing that makes this chapel really significant is the inclusion of a courtyard. My eye was immediately drawn to the octagon-shaped planter box/bench with a tree growing in the middle of it; this is fantastic. As described previously, the octagon or number 8 has deep ties to rebirth, especially through Jesus Christ and to see a tree in the middle of an octagon doesn’t seem to be coincidence to me, they could have easily made this planter box a square or circle. So two symbols of Christ are demonstrated here, one focusing on rebirth through his atonement and another demonstrating that he is the embodiment of the love of God. There’s a lot to ponder here, but I really like where chapel construction is headed. I’d really love to take a tour of this building and see what other potentially symbolic teachings it holds. I love the idea of our chapels being a place where we are surrounded by symbolic motifs to ponder, in the same way, that our temples do. Kudos to the inspired Church architects for the beautiful simplicity in which they build our chapels. Have you noticed any symbolism in your own chapels? Do you attend an older chapel with any interesting designs? I collect chapel photos, so if you have any that are interesting, send them in! What I see with the standard building plans for church buildings around here, are that they are all the same. You can go to one ward building and pretty much know where everything is because it is patterned after the one you got o all the time. Same floor plan, same interior with brown carpeting on the walls, same lack of natural light. Everyone having the same type of building might be an efficient way to erect structures, but I see it as kind of like coporatization, or socialistic. There are no windows except in the classrooms and entryways. The classroom windows are all frosted, letting in muted light and no one can see in or out of them. This is good, in a way, I suppose, since the classrooms have windows that go pretty much floor to ceiling and would be a distraction to teachers if everyone could see into the classrooms. As it is, kids manage to push out the screens and crawl out, because the windows are so low down. The chapel and rec. hall, being in the center of the building, have no natural light and the feeling is somewhat dark and muted. Kind of like being in a closet. I attended a funeral, one time, when the power went out. It was totally dark in the chapel. No light could be seen unless one of the doors were opened to the foyer. The funeral had to be suspended until someone could obtain light. My husband and I went home to bring back some lanterns. Then we were told that they could not be used because of building codes. Nothing with flame was allowed, even in enclosed lanterns. So someone else had to hunt down a battery-operated lantern. I’ve heard many ward members wistfully mention how they miss the old chapel where there were windows on both sides of the chapel and the sunshine could come in freely. I guess not having windows cuts down on having curtains or washing windows? The classrooms in the new buildings are all very small. Very little space for movement or activity, especially if you happen to have more than 6 or 7 kids in the room. The kitchen has been reduced in size from former ward kitchens that allowed several people to be working in there at once. Only two or three at a time can work comfortably in the new kitchens. This cuts out on the good times we had while cleaning up after ward functions, where the men could even join in with the women in doing up the dishes. We were told when the building was being built that wards were not suppose to prepare food in church buildings because it was against health codes, hence the smaller kitchens. Our new buildings around here didn’t have steeples on their roofs, for many years. Then magically a steeple appeared atop our ward building, as well as others around that had the same building plan. A sort of modernistic type steeple, if it could have been called such, had sat upon the ground, out beside one of the entryways. From a distance no one would have known the building was a church house, before the steeple was placed atop the buildings. I’m sorry, but I only see negative meanings in our ward building plan. liked our building because of the somber, dark feeling it has. Everything was corporatized, where one size fits all and all must be alike. I’ve never liked a socialized type of anything, so I see these buildings as a symbol of the type of society we live in today, of dimming light, everyone being fitted into a corporate machine that runs well because everyone is a cog and where those at the top can know exactly what is needed where and when and how much it will cost to maintain. Efficiency over individual accountability. That is what I see in our present symbolism of the “modern” types of ward houses, sorry to say. First off, things go through phases and cycles. I think our chapels are just growing out of their awkward teenage stage. The braces are coming of, the rats nest hair is being tamed and the acne is healing. Something similar happened with temples in that celestial symbolism on the outside of the buildings were not included. It wasn’t until 1989 that we saw a return to the original vision of temples that Joseph Smith introduced. Now we are seeing some really incredible temples. From an aesthetic perspective I think we could do a lot better at building chapels and some of the newer ones that I’ve seen look promising. I don’t like ugly buildings any more than you do but I try to have a little understanding when looking at the subject. First off, we build a LOT of chapels. Having a pattern allows more chapels to be built more efficiently. It’s better to have a chapel than none at all, wouldn’t you agree? This way you can buy windows, doors, toilets, etc in bulk. You could say that it is being too corporate but you could also say that It is being a good steward of the tithes. If the church only build extravagant chapels that were all custom designed and built, they would be criticized for not being efficient with tithes and not getting chapels to those that need them. The church is responsible for building chapels to meet the growth of the membership in accordance with the tithes that come in. If you have to build this many chapels and you only have this much money then you have to balance quality, quantity and budget. Call it whatever you want but at the end of the day, decisions have to be made and chapels have to be built. I’m sure they do the best they can with what they have and are always looking to see how they can improve things. I’m not a fan with the phase of chapel building that we have come out of. Like you, I dislike the windowless, unappealing look many of them have. But I see some good signs. I think they’re realizing that natural light saves electricity and they have much better designers and architects who seem to be trying to improve the aesthetic within the budget. This particular chapel I commented on is evidence to me that we are slowly moving out of the type of chapel that you are lamenting. I don’t think that the church is trying to imply the things you suggest, but the fact that you feel that way is evidence that architecture can influence people’s feelings and thoughts. It can uplift or it can depress. With the new renaissance in temple construction and the amazingly well designed structures we are seeing there, and with new changes happening with chapels, if things continue along these lines I think we will some wonderfully designed chapels in the future. Personally, I’m looking forward to see where things are headed. Your comment illustrates another principle. Symbols can definitely communicate intentional messages, but they can also work like a mirror, reflecting back to us our own knowledge, prejudices and perspectives. Sometimes it can be difficult to ascertain which is which. The elegant building you featured in this post is nothing like the drab, dated, smelly, and cramped building that the 300+ people in my ward, and the 300+ people in the ward who share the building, attend every week. 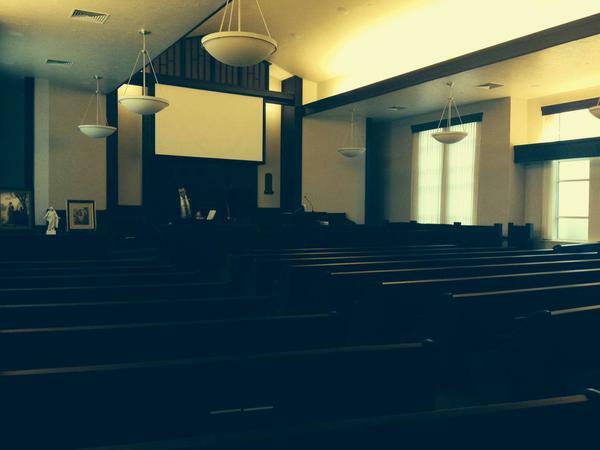 We use the entire chapel, overflow, and cultural hall to seat everyone for sacrament meeting, and then use the same spaces for Sunday school and Primary. And no, we are not in a third-world country, but in an affluent area of the US. We have wealthy people in our ward. Our Stake has not had a new building since the 1980’s and the Stake center houses 3 wards. 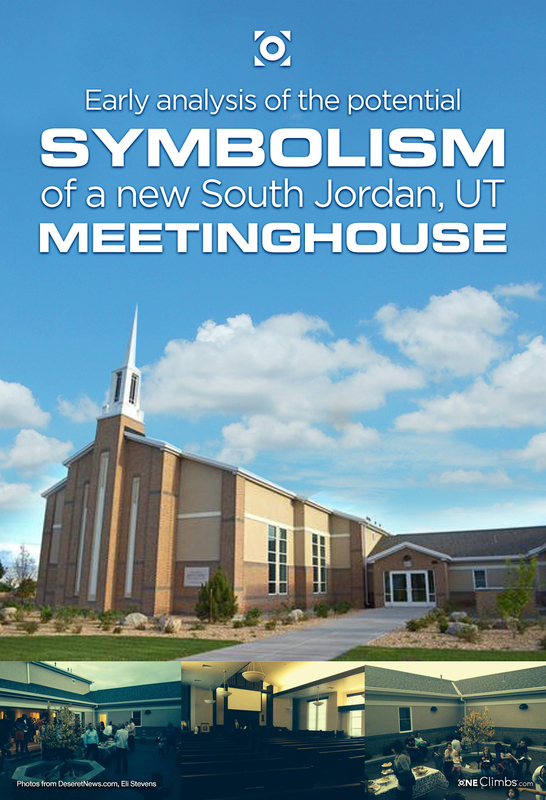 I could not possibly care less about the lovely symbolism in your elegant Utah chapels. That’s too bad about your chapel, but I hardly see the purpose in venting about your dissatisfaction on a post about symbolism. 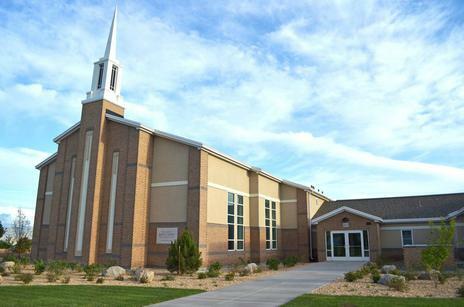 Note that I am not from Utah and don’t live in Utah, so this is not one of “my” elegant chapels. I grew up in South Texas in one of the slowest growing Stakes in the Church where it has never split since its creation in 1968. I’m sure I could think of a lot of things to complain about as well. I wish we had as many people in our ward to fellowship with as you do. In some countries they don’t even have chapels let alone people to fellowship with freely without the threat of violence. I’m afraid that you missed my point in writing the article. I’m trying to show that the Church is starting to build chapels that are incorporating symbolism often observed on temples. Why not be thankful that new and good things are coming into the world instead of hating on them? Perhaps I’m in the minority here, but as one who appreciates architecture, art, dance, music, literature, and the other arts, I think it’s fantastic that the Church grows from “grace to grace” in all of their endeavors, including the building of chapels. We must remember that the first building the early saints were commanded to build was the Kirtland Temple. They were a poor people with little money and limited resources. But with God, all things are possible. I encourage you all to read the story of Artemus Millet including his conversion, immigration to the United States of America, and his overseeing of first the Kirtland and then the Manti Temples of the Church of Jesus Christ of Latter-day Saints. The building of the first “official” meeting house in the history of the Church did not occur until the Saints arrived in Nauvoo. It was very plain and practical. And we have been improving forward in building construction ever since. Scriptures and Music are other things that become refined as time goes on. 2013 saw the release of an updated version of our English Scripture Canon. New manuals come out every year. With the increase in the Missionary Department’s use of technology, they are in the process of rewriting “Preach My Gospel.” This is surprising to me because I used the “Purple Dinosaur” on my mission, and I don’t feel like I’ve been home for very long, (although some say I’m in denial – it has been 10 years since I’ve been home). The point is that things are changing all the time. We live in a Church of constant revelation. And how great it is for such a precious blessing! I think the greater issue here, (from the two earlier posts I read), is pride. As a convert to the Church back in 2000, I went to my Sunday meetings in an old house that used to be home to a college sorority. The rooms were small. The winters were cold. The piano (if you could call it that) was always out of tune. There were no pews or benches – we sat in small plastic chairs. We were often cramped, (I could play the piano, bless the Sacrament, and basically give a talk from where I used to sit). But I tell you with a firm testimony that I heard some of the greatest sermons sitting in that corner. I attended some of the most fulfilling and uplifting Sunday School and Priesthood classes that I have ever attended in my life. The point is not WHERE you meet, it’s with WHOM you meet, and with WHAT Spirit attends the meeting. And most importantly, it’s WHY you are there in the first place. In Jacob 5, The Lord of the Vineyard speaks of yielding some of His most precious fruit that was planted in the “poorest spots” of the vineyard. In verse 22, He says, “Counsel me not; I knew that it was a poor spot of ground.” He spends much time nourishing this “poor” part of the vineyard that it does produce good fruit like unto the other parts of His vineyard. One possible meaning is obvious: it doesn’t matter where you are or what you have, it’s what you DO with the circumstances in which you find yourself. Just Curious: Why doesn’t this post appear in chronological order anymore? (October 16, 2014). It seems like it was removed from the homepage. You know, that’s happened with a couple of my posts. I don’t know what the deal is with that it’s weird. Today’s Meetinghouses – Tomorrow’s Temples? Our current LDS Meetinghouses differ in size, shape, age, building material, and function. For the sake of this post, let’s imagine there is a regular-size building that houses one, two, or three wards. It has a chapel, cultural hall, Relief Society room, primary room, various smaller classrooms around the perimeter, offices, restroom facilities, kitchen, storage areas, custodial areas, two or more furnished foyers, baptismal clothing storage/changing areas, and a font. In our ward, we are responsible for cleaning our building several times a year. Anyone who has had the privilege of doing this service knows what a time consuming job it is! Even our smaller meetinghouses are like schools; many people use them, many people come and go each day, and many people spend a lot of time there. The point is this: each building is a miracle in itself and has the capacity to take care of many temporal needs of the Church. And what about the spiritual capabilities of a meetinghouse? This should go without saying, but our meetinghouses are and should be treated as sacred space. We could do a lot better in the church to be more reverent in our meetinghouses. My Mission President always reminded us that when we were in the chapel, we were in “The House of The Lord.” There is a special reverence associated with the chapel – it is where we renew sacred covenants each week with our Savior. Partaking of the Sacrament is the most important thing we do in the chapel, and the most important thing we as members of the Church do each week. Many other Priesthood ordinances occur in the chapel as well as in other areas of the meetinghouse, (baptism, ordination, blessings, etc…) We are often told that our homes should be clean and orderly, so that the Spirit of the Lord may be present. We are told that they should reflect the Spirit found in the Temple. If this is true of our homes, this is certainly true of our meetinghouses. 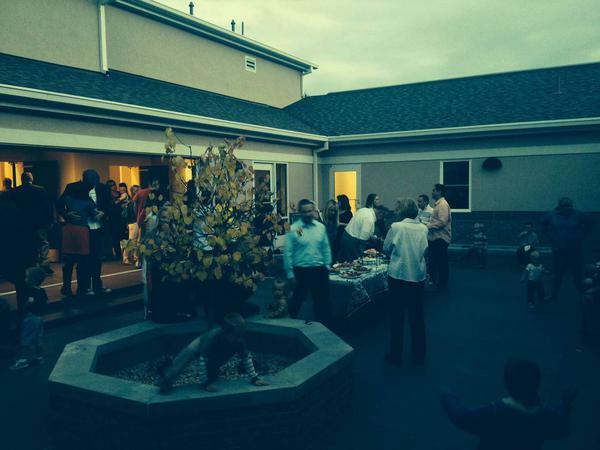 Right now, our meetinghouses serve many purposes which are specific for our day. Besides meeting our temporal needs, these buildings allow us to become more perfect in preaching the gospel and perfecting the saints. As technology increases, we also do much of the preparatory work for redeeming the dead. As a convert to the Church, one of the things I have noticed and REALLY NOTICED over 13 years is that this is definitely a church of revelation! Things move ahead at a very rapid pace. Programs change, leaders get released, new leaders get called, missionary work changes, the focus on particular applications of principles change, new callings are created, some callings are discontinued, etc… In the Millennium, we will be serving the purposes of THAT day, not our current day. I testify that I have seen the Spirit work through the various cycles the Church goes through – even as a member of only 13 years. Truth is truth for eternity to eternity. But as the Church is a living organization, it moves from grace to grace and learns from its history. It is also constantly receiving revelation on how to move forward. Look at yourself in the mirror. You are an embodiment of truth. Now look at a picture of yourself ten years ago. You probably noticed that you look different. Is it still you? Are you still that same embodiment of truth? When I was an ordinance worker in the Provo, UT Temple, I had the opportunity to see some amazing technological advances in the way the Church is able to help its members serve. While a lot of these technological advances had to do with language and translation, one change was the installation of huge LED flat-screen television monitors in certain rooms where temple workers have their prayer meetings before their day begins. I recall a member of the Temple Presidency saying that “If we needed to, with the use of this new monitor, we could administer the entire endowment to patrons in this very room.” Compared to the comfortable room in which I was sitting, in my mind I immediately thought of the early Saints and the poor conditions where they received some of the first endowments of this dispensation. It made me think of the value of the ordinance itself, rather than the place it is administered. The Lord is always able to consecrate and sanctify space for His own purposes. In the Millennial Reign of our Lord and Savior Jesus Christ, who’s to say that some of our meetinghouses will not be used for temple work? We don’t know everything that will happen, but what are some of the things that we know for sure? We know, for instance, that the greatest work during the 1,000 years of peace on the earth will be redeeming our dead. There are billions of souls who need their temple ordinances completed, and we are told that the majority of this work will take place during the Millennium, (or else the whole earth will be utterly wasted – see D&C 2). As this earth moves into a terrestrial state of existence, I can very easily see our meetinghouses becoming temples for this great work to be accomplished. Ok so I’m going to share something that I cannot substantiate the authenticity of so take it for what it is worth and include the possibility that is it not even true. I’ll share it just in case someone else out there could help to confirm it. I volunteered at the San Antonio Temple dedication several years ago and overheard a conversation between some guys that were also volunteering out by the parking lot. One of the men claimed that he knew someone involved in constructing buildings for the church and stated that modern Stake Centers (for a time not specified) are being constructed in a manner that they can be converted into temples during the Millennium. That’s all I heard. I don’t think this would be outside the realm of possibility though. Stake centers, like temples are centrally located and many, if not all contain baptismal fonts, whereas many chapels nowadays do not. The way modern temples allow for linear movement from the endowment rooms to the Celestial room. The chapels and stake centers are built the same way, you have a long cultural hall (basketball court) right in line with the chapel. With some remodeling, those rooms could be configured into endowment rooms and a Celestial room. The move to smaller temples, many of which are not that far off from the way chapels themselves are laid out is rather curious. This is all speculation mixed with second hand accounts so take it for what it’s worth and be careful about how you share it. Ultimately, it doesn’t matter, what’s going to happen will happen and I’m sure there will be a lot of surprises anyway. But perhaps it might help one conduct themselves a little more reverently (as one should anyway) in a place of worship. Steven, thank you so much for your quick response. You said many of the things that I was thinking, (like the layout of chapels, stake centers, and smaller temples). It is curious indeed! I would not be surprised in the least if modern meetinghouses are built with the purpose of one day being used for something else. After all, it would not be unprecedented in the church. As I’m sure you know, Brigham Young saw in vision many things that he didn’t quite understand when the Salt Lake Temple was under construction, but he went along with it. Later, it was found that the Salt Lake Temple was perfectly rendered to include to the installation of things like electricity, elevators, central air, and the present day annex. I believe that the least of our buildings are well-thought out, inspired, and built not just for today but for future purposes. We at least know this – if it is a Church building, it is built with Priesthood authority.